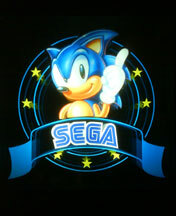 Sonic electronics: If you have to add batteries or plug it in, it's likely here. 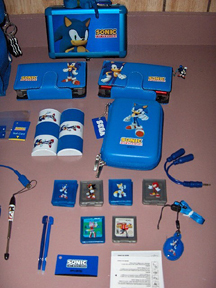 This includes figures, games, and basically anything battery powered that was sold around the UK area. Most of these items are vintage, but a few are fairly new, so everything should be marked with when it could be found. 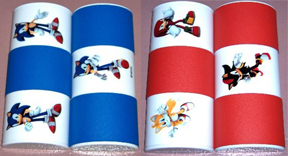 As usual, if it's old, your best bet is Ebay to try and collect some of these interesting items. 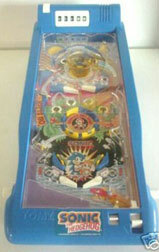 A pinball game, claiming it is Brittish. This is from Tomy (who I guess sells there as well) It may or may not be electronic, as you can see spring-laoded switches and numbers at the top. The photo was never very large, so it is hard to see all the gimmicks this might do. (though supposedly it was quite loud, and did need batteries) 1994, it was 27.00 pounds when new. 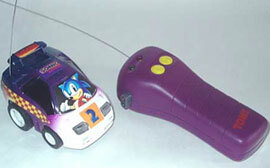 This is a Sonic X remote control racer. Not sure why you'd need this, but it's interesting at least, maybe like a large action figure. 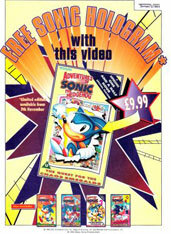 This oddly purple walkman-like tape player goes with the "Sonic Sound Zone" cassette tape box seen on another UK items page. Why it is hot green AND purple though...still, this was supposedly a terrible item all around. Not only did it clash, but it never even had a rewind button! (see 3 buttons only) Which, even at the time was quite terrible. 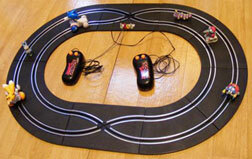 Well, in the winter of 2008 Impact Innovations got around to producing this racing set. 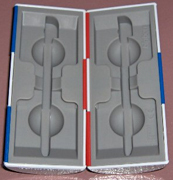 It was shown as a prototype earlier, but this is the real set. 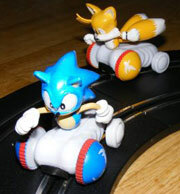 As predicted, it is quite an ordinary race-track, with Sonic & Tails being the only 'Sonic-ish' things about it. The controllers (wired to the set) have a classic styled logo sticker on them. 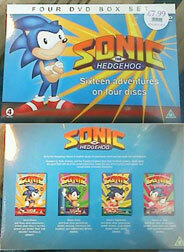 The box is fairly oldschool looking, with classic stock-art and the words "Super Sonic Racing System" and "Race them all the way!" 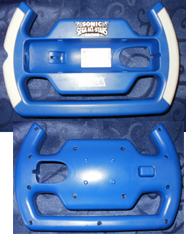 This is the protype photo, notice the different controlers. returned. 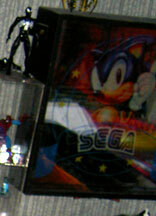 The combination of "Rare" and "Doesn't work" plus a starting price of 12.00 pounds (about $24.00 USD) it a terrible one. 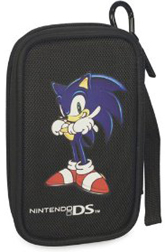 The ones that didnt' sell apparently went on clearance--meaning it is not likely this will return to stores. 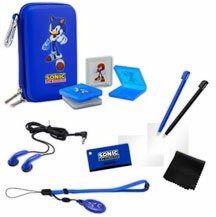 * you can buy this in 2010 at Argos store online for about 9.97 pound. All info and photos (except prototype & argo) by The GagaMan. 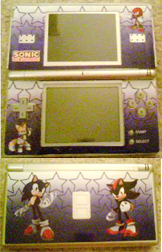 Here's a great selection of items for your DSi! With the car out of the box, you can see the front-fade & real color. Also the remote for it is larger than it is! This was made by Tomy. 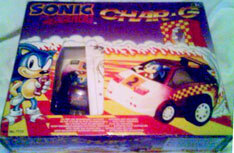 Here is a new-in-box Char-G car.